Looking for things to do in Broadstairs? Just 40 minutes drive from Yorke Lodge, Broadstairs is located on the Isle of Thanet between Margate and Ramsgate. If you don’t feel like driving, there is a train from Canterbury West Station (a 10 minute walk from Yorke Lodge) which will get you into Broadstairs in just 36 minutes. Sitting on the very tip of Kent, Broadstairs is known as the “jewel in Thanet’s crown”. The town’s motto is “Stella Maris” or “Star of the Sea”. So even before you get there this is much to recommend this excursion from our B&B. There are very many things to do in Broadstairs. And for days out in Kent it doesn’t get much better! Broadstairs is perched on a cliff top giving beautiful views across the English Channel. Just below the cliff is the iconic Broadstairs beach. Formerly known as Main Bay, the beach was renamed Viking Bay in 1949. This was to celebrate the 1,500th anniversary of the landing of Hengist and Horsa. Hengist later became the first “king” of Kent. It took another one thousand four hundred years, though, before Broadstairs became a fashionable seaside resort! Princess Victoria stayed here as a young girl before becoming Queen in 1837. As well as royal associations, Broadstairs has distinguished literary connections: John Buchan’s “The Thirty Nine Steps” takes its inspiration from nearby North Foreland Lighthouse. Which, by the way, was until 1998 the last manned lighthouse in the country. And Charles Dickens spent many summer holidays in Broadstairs in the mid-1800s. But more about him later. Viking Bay is right in the centre of Broadstairs. It is not only convenient, but also gloriously sandy! It offers the perfect place for a beach holiday with children’s rides, beach huts and surfing. To the north of Broadstairs there is Joss Bay, a surfers paradise. Also Botany Bay with it’s fascinating chalk stacks. Once a smugglers haven Botany Bay is now better known for fossil hunting and relaxation. All the bays offer refreshments and other facilities. However, out of season it is worth checking opening times before going. 2. Italian Ice Cream With a View – It’s a Scoop! But you don’t have to leave Broadstairs for seaside refreshments! Two Italian ice-cream parlours offer authentic Italian ice-cream while enjoying views to match! Morelli’s Gelato was founded in 1932. Still family run, Morelli’s remains true to its origins offering the ultimate in nostalgic experiences. With everything from a juke box to pink leatherette booths and of course freshly made ice-cream! Tea and coffee, soft drinks and panini and even Prosecco are also on the menu. With views over Viking Bay Morelli’s is located at 14 Victoria Parade, Broadstairs CT10 1QS. Chiappini’s is another Italian ice-cream parlour on the seafront. Also with stunning views over Broadstairs Harbour and Viking Bay. They specialise in Italian ice-cream but also offer coffee, meals and snacks. 1 The Parade, Broadstairs CT10 1NB. As already mentioned Charles Dickens was a frequent visitor to Broadstairs. He loved the bracing sea air and took much inspiration for his novels from Broadstairs and its inhabitants. Readers of David Copperfield will recognise the museum as Betsy Trotwood’s home. Betsy Trotwood herself, is based on Mary Pearson Strong who lived in the house. She was also well known to Charles Dickens. Items that once belonged to Charles Dickens are on display here among other Victorian memorabilia. With its rooftop crenellations it will be no surprise that Bleak House Broadstairs was originally called Fort House. Indeed Fort House was home to the captain of two coastal forts guarding Broadstairs. It was built in 1801 and was Dickens’ favourite place to stay in Broadstairs. Fort House became known as Bleak House in the early 20th Century. This was when a guest asserted that it was the setting for Dickens’ novel of the same name. This has been much disputed and never proven. Despite this the name Bleak House has stuck. This was set up in 1937 to mark the centenary of Charles Dickens’ first visit to Broadstairs. With the exception of the Second World War years this has become an annual event. It is held during the third week of June. Dickens was so delighted by Broadstairs that he called it “Our English Watering Place”. Born in Broadstairs in 1816, Thomas Crampton was first a plumber and architect. He later qualified as an engineer and is chiefly associated with the railways. But he was also a pioneer in Victorian technology. He undertook revolutionary projects in gas, water works and telegraph cables.In 1851 Crampton laid the first working telegraph cable under the English Channel. Back in Broadstairs Crampton installed a pump in the Bath House (now Chiappinis). Not only did he pump water up from the sea, but he also heated it. This allowed his friend, Charles Dickens, the “solace” of taking warm showers when the sea was too cold! The Crampton Tower Museum is a vibrant celebration of the life and times of this extraordinary Victorian engineer. The Broadstairs Gallery, 10 Charlotte Street, Broadstairs CT10 1LR – with a collection from both local and international artists. Original artwork and limited edition prints, art prints and greetings cards. Also offers a bespoke framing service. The Little Art Gallery, 1 Eldon Place off Harbour Street, Broadstairs CT10 1NA – Collection includes original paintings in oil, watercolour, acrylic and pencil. Also murals, photographs on canvas, commissions and art classes. New Year to Easter weekends only. New Kent Art Gallery & Studio – 49a Albion Street, Broadstairs CT10 1NE – Fine Art Gallery – local artists. Paintings, sculptures, crafts, ceramics, gifts. Working studio and resident artists. Changing shows every fortnight. A hub for artists and makers. Musical events are held throughout the year at the Bandstand in Victoria Gardens. These are mostly during the summer though, for obvious reasons! Daily folk shows are held during Folk Week that takes place annually in August. Just a little further along from the Bandstand is the Broadstairs Information Kiosk. Run by volunteers from April to the end of October. At any time of the year though, this is a good starting point for the Broadstairs Town Trail. It takes in most of the above but a whole lot more too! The Trail can be adapted to include a cliff top walk towards Ramsgate with spectacular coastal views. A comprehensive leaflet outlining the Broadstairs Town Trail can be down loaded here. A little further inland is St Peter’s Village. Now an area of Broadstairs it was once the more important of the two settlements. St Peter’s has a magnificent Norman Church and a wealth of history all of its own. The St Peter’s Village Tour gives a fascinating insight into how the area has developed over many years. This is a 4 mile inland walk between Broadstairs and Margate. It starts in Broadstairs at the Dickens House Museum. It then largely follows an ancient footpath.The walk ends in Margate at the Turner Contemporary Gallery. A fun and informative leaflet and map can be downloaded here. Should you choose not to take a map look out for “T&D” signposts along the way! 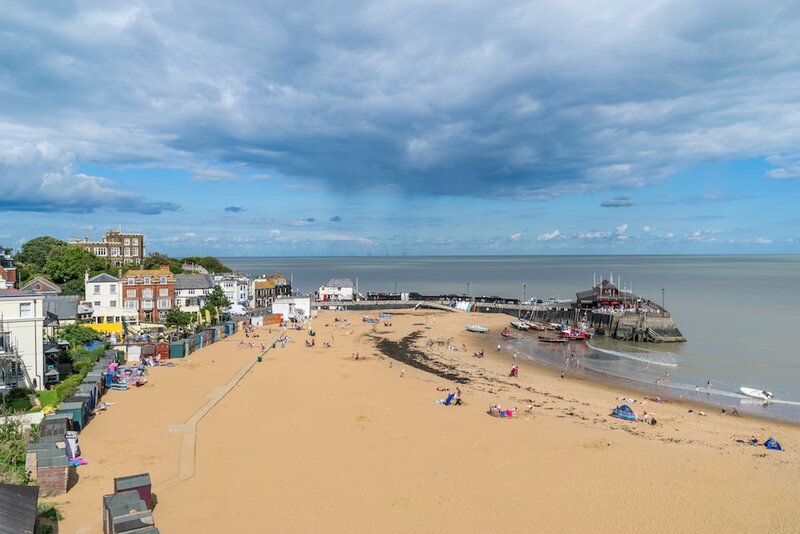 So you see, there are lots of things to do in Broadstairs! Everything from a bit of culture, to extreme sports. From bracing cliff top walks to strolls down memory lane. We have mentioned the Dickens Festival and Folk Festival. There is also the 3 day Broadstairs Food Festival and Broadstairs Water Gala. Things to do in Kent don’t come more varied than this! For lots more ideas, do ask at reception.